I have decided my next project needs a laser attached. 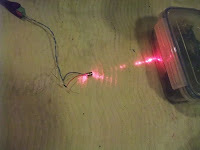 Having bought a small laser pointer to butcher I then decided I really ought to just buy some laser modules as they can be had cheaply on eBay. I can foresee these getting used a fair bit because even when they're just 5mW cheapies, lasers are still cool.